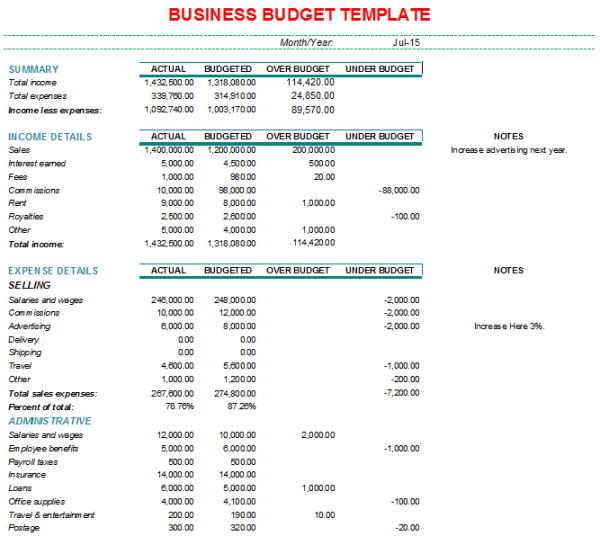 The format is the monthly business budget format (template) with charts. This template comes with a chart that shows how your estimated expenses compare to your actual expenses. This visual assurance that you are staying on budget can be a great motivator. The chart shows your income and expenses. Are your actual expenses more than your actual income? How do your actual expenses compare to your estimated budget? These figures can help you determine how solvent your company is and aid you in creating a budget for the next month. With this business budget template, you can determine your top five operating expenses. This template allows you to collect the percentage of expenses to your overall budget. You can also calculate the percentage change from the previous month. You can also break down expenses into personnel and operational. For example, employee benefits are considered a personnel expense while advertising is an operational expense. You can also break down where your income is coming from. What part is coming from selling goods and what is coming from offering a service? Are you receiving any income from interest? How does your estimated income compare to your actual income?